Our gateway to the league group stage of the Europa League? For the second time in a week and the fourth time in a year we are playing Astra Giurgiu of Romania. This time it is for a place in the group stage of the Europa League which will mean an additional six Thursday games between now and the end of the year if we overcome them successfully. Will we be able to cope if we get through? Last Thursday we drew 1-1 in Romania. The result should have been so much better. Shortly before the Astra equaliser we missed a really good opportunity to extend our lead to 2-0 which would have put us in a very strong position for the second leg. But it was not to be so we go into this game all square with an away goal. We were not particularly impressive in our opening Premier League game on Sunday but nevertheless we claimed three points with Antonio’s late goal. It is still early in the season and we have many first choice players unavailable at the moment so let’s not get too disheartened. Some people on social media are really depressed about the way we have started but there is a long way to go this season. And if you compare the same games with last season (when we lost at home to Bournemouth and drew away at Chelsea) then we are already two points better off! Astra Giurgiu may be the Romanian champions but they are in disarray as a club. They have numerous off field problems which are well documented, and their league performances are going from bad to worse. Before we played them last week they sat in ninth place in their domestic league. At the weekend they took a 5-1 hammering at CFR Cluj and have now sunk into eleventh place. They would be even lower if it wasn’t for teams close to the bottom (including CFR Cluj) who have had points deducted this season for “irregularities”. So this game should be straightforward, shouldn’t it? If we put out a half decent team (and Slav has confirmed that we are taking this competition seriously) then there is no reason why we shouldn’t progress comfortably into the group stage. Scoring seems to be our problem but hopefully we will have some of our creative players back (Dimi and Manu?) and open up their defence at will. An early goal or two would be good – I am hoping for a 3-0 win at least. The group stage draw takes place in Monaco on Friday with the first two Europa league games scheduled for 15th and 29th September, which are prior to our weekend games away at West Brom and then home to Middlesbrough. The next two European games are scheduled for 20th October and 3rd November, prior to the Premier League games at home to Sunderland and Stoke. So if we get through this match, and you prefer your Saturday games, you should savour our home game against Watford on Saturday 10th September which kicks off at 3pm. Because if we beat Astra, the Watford game will be our only Saturday game in the first half of the season until at least December! I hope you are free on Sundays! The latest in the series of first ever games at the new stadium. So after the actual opening game and the official opening game we are finally getting down to the real business of the opening league fixture at the new Stratford stadium. 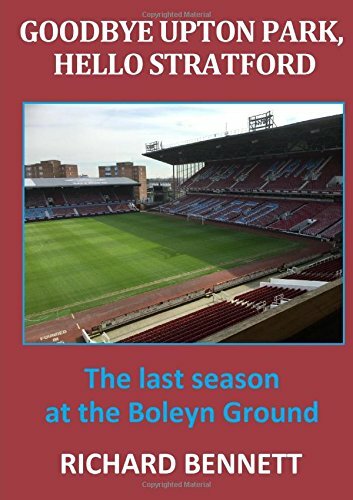 In the process we will be setting a new club record home league attendance surpassing the 42,322 (including my teenage self) that were squeezed into Upton Park for the 2-2 draw with Tottenham Hotspur in October 1970. Today’s visitors may now have taken on our pre-state aid mantle of everyone’s second favourite team following their unlikely (usually termed as fairy-tale) rise from the lower reaches of the league pyramid to the very top table of English football. A creditable mid-table finish last season did nothing to diminish the reputation of bobby-dazzling Bournemouth manager, Eddie Howe – only signing Jordan Ibe for £15 million has been able to do that. Rumours circulating on the internet suggest that every West Ham outfield player, with the exception of Mark Noble, is unavailable through injury for this game. Our usual inside Under The Hammers sources were too busy taking out the bins to either confirm or deny the reports which have, in any case, been made up in a poorly disguised attempt to get visitors to the site. Longer term injuries continue to plague Ayew, Cresswell, Lanzini, Sakho and Feghouli and none will be available for consideration today. Physio Room also shows Payet and Nordtvelt suffering from knocks but there is nothing on Kouyate who sat out the midweek match in Romania, again with an apparent knock. More speculative chatter, which to be honest would be no big surprise, is that Andy Carroll is broken again – once again proving that he is ‘unplayable’. I also came across comments by Slaven Bilic about not rushing Payet back to the action following his exertions at the Euros so maybe he is still a little tired, bless! Former Hammer, Junior Stanislas, who has just signed a new 3 year deal with Bournemouth is absent from their squad (with a scary sounding inguinal hernia injury) but new signing Marc Wilson, formerly of Stoke City, may make a first start. Today’s potential short-sighted official is Craig Pawson from South Yorkshire. Pawson, who as luck would have it is a Sheffield Wednesday supporter, took charge of the two exciting home draws against Manchester City and Arsenal last term. You may remember it was Pawson who did the double dirty on Manuel Lanzini in the latter match by incorrectly disallowing a headed (what would have been opening) goal and then denying a blatant penalty following a foul challenge by Bellerin. Suffice to say that Craig owes us one. We’d much prefer to be beside the seaside as Bournemouth become the very first league visitors to our new Stratford home. If you qualify to play in Europe after a successful Premier League campaign then you must expect the games to come thick and fast. And that is exactly what is happening. Less than a week ago we began the league season with a 2-1 defeat at Chelsea. Just three days later we were drawing 1-1 in Romania. And less than 72 hours will elapse before we take to the field for the very first home Premier League game in front of 57,000 spectators on Sunday at our new stadium. For the second season in a row the fixtures computer has arranged for us to play Bournemouth on the same weekend in August. And both times the game has been in London when many of our fans may have preferred a trip to the seaside in the summer, rather than on a cold January evening as was the case last season. But if we think the schedule is hectic this year we need to remember that last season the home Bournemouth game was our fifth competitive home game of the season and our ninth game overall! Last August it was a nightmare game from a defensive viewpoint as we conceded four times in a seven goal thriller. A great game for the neutrals as Slaven Bilic said, although I doubt there were many neutral spectators at Upton Park on that hot Saturday afternoon. Jenkinson and Cresswell both chose the same day to play their worst games in a claret and blue shirt, but neither will be playing this time of course. And virtually everybody in the ground on Sunday will be hoping that Antonio is not selected to occupy the right back position, although most will hope he is in the team! Of course one look at the early league table reveals that this game is one of the season’s first six pointers with both ourselves and our visitors pointless after our opening matches. We scored three goals against them in both games last season and we are looking for another three goals and three points to open our account this term. This is the twenty-fifth season of the Premier League so nobody younger than thirty will remember the old days when the top tier was called Division One. We did not participate in that opening season of the Premier League in 1992 as we had been relegated after finishing bottom of Division One the previous May in the famous bond scheme season that provoked ugly protests. It was these off field matters which many believed contributed to many poor performances on the field. So despite relegation from Division One we still found ourselves in Division One which was the name given to the second tier at the time, which is now known as the Championship of course. Interestingly, in that season, which culminated in promotion to the Premier League for the first time the following May with a last day victory over Cambridge, we had our first home game on 22 August, a day later than this year. On that day we went down to Charlton by a single goal of the game in front of just 17,000 at Upton Park. For the next home game a fortnight later fewer than 12,000 were there for the visit of Watford, and the home attendance continued to fall game by game hitting a low of just over 10,000 for the visit of Sunderland in October, when we recorded a 6-0 victory. How times change when we consider that many are disappointed with the restriction to just 57,000 on Sunday! The tension builds as West Ham seek to build a winning first-leg foundation. West Ham have travelled to Romania for tonight’s Europa League qualifying play-off first leg tie against the Black Devils of FC Astra Giurgui (Kick Off 19:15 BST). It was Astra who ended the Hammer’s European dream last season with a 4-3 aggregate win in our only previous encounter with the current Romanian champions. Previous meetings with Romanian opposition in Europe competition (where we have yet to record an away victory) saw UEFA Cup elimination to Steaua Bucharest in 1999 and victory against Poli Timisoara in the 1980/81 Cup Winner’s Cup. Coincidentally, Astra recorded their first league win of the season last weekend against bottom side Poli Timisoara. Until 2012 Astra Giurgiu were known as Astra Ploiesta until the club was moved 130km to the south by the current owner despite long running protests from Barry Hearn. This would be the equivalent of Reading moving to Southend and a far greater upheaval than our recent relocation from Upton Park to Stratford. The move heralded Astra’s first ever Romanian championship victory. Despite the game sandwiched between our tame defeat at Chelsea and the opening home fixture with Bournemouth it is expected that the Hammers will field a strong side in order to secure Europa League group stage qualification. It seems that Ayew is now out for an extended period and joins Lanzini, Cresswell and Sakho on the recuperation ward. Under The Hammers sources (i.e. we read it on the internet) suggest that Payet and Nordvelt have not travelled with the squad but that new boy Callieri managed to grab a spare seat on the plane. Arthur Masuaku is not yet eligible but no news, as yet, on the whereabouts of Sofiane Feghouli. How we line up will be awaited with interest particularly the thorny full-back situation with Byram being our only available specialist in that position. I searched to Google to see if there was any possible academy replacement but all I got was “Page Not Found” (or at least out on loan along with Hendrie). Involvement from at least one of the Reeces tonight would be very welcome along with a role for the unfortunate Antonio as a midfield attacking threat. – Porto President Pinto da Costa on tonight’s referee. The man in the middle tonight is Artur Dias of Portugal who was once described by Porto’s President as scandalous and disgraceful following his performance in a Benfica – Porto derby game. We managed to avoid a repeat of last year’s red-card-fest in the previous round so fingers crossed that discipline is maintained. My prediction for what it is worth is that our Romanian duck will endure with a scoreless or low scoring draw.